Long Time Viking on the move to Switzerland! 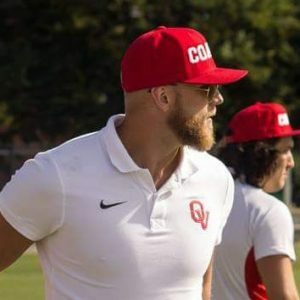 Coach Nicolay Knutsen is the new Defensive Coordinator for the Calanda Broncos in Switzerland. For the 2019 season the Oslo Vikings will be without our long time coach, Nicolay Knutsen. Coach Knutsen has accepted the Defensive Coordinator job with the Calanda Broncos in Switzerland. 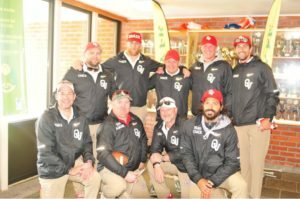 Nicolay has been patrolling the field and sidelines for 18 years with the Vikings and is now taking his coaching skills to the top level in the Swizz league. 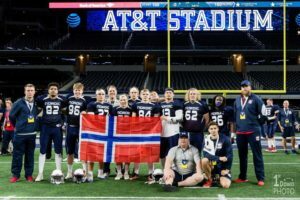 Team Nordic at at&t stadium in Texas. We had a chance to catch up with coach Knutsen and speak to him about his new role with the Broncos. First off, congratulations on your new role with the Calanda Broncos in Switzerland. Can you explain what your role will be within the club? Thank you. Really appreciate the congratulations. I have been so thrilled and happy about the response everyone has given me after this offer. Yes, I am hired to be the Defensive Coordinator, and Defensive Backs Coach for their Senior Program, under a great Head Coach in Geoff Buffum. I will also have the same roles for their U19 program, where a really good colleague in Coach Alexander Durazo landed the HC position. Both programs run in a spring season, so really looking forward to get to work with that. Can you give us a brief summary of your coaching past and how you got to this point in your coaching career? Well, looking back its not that brief anymore. Or maybe I’m just getting of age. But I will give it a go. I started my first Coaching gig the year after my last season with the Oslo Vikings U19 program. I was HC/DC along with Robert Mehmet from the year 2010 there Through 2014. 2015 I had the DC job with Alexander Moe at the helm as HC. Came back as HC in 2016. In 17 we did not have a team on this level, but came back in 18 with a very strong program, led by Derek Mann, where I had the DC role again. Meanwhile I have had HC/DC roles with the U17 program from 2016-18. Helped with 2nd Division in 2016 & 20 17. I started working with the Seniors Elite team as DB coach in 2016, took over DC in 2017, and was able to keep that job until today. In addition, I have been the DC for U17 and U19 Norwegian National Team, together with an amazing staff last couple of years, which has been a magic ride. Where we are now qualified with the U19 team to try and enter EM. 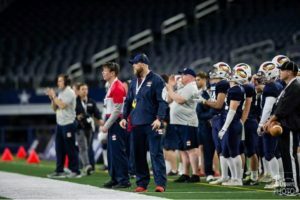 And was in 2018 lucky enough to get the opportunity to work as DB coach for team Nordic, playing team USA @ AT&T Stadium. That still gives goosebumps! Coach Knutsen with the Norwegian representatives for team Nordic. Did you know much about the Swizz league before accepting the job? What do you expect from the level of play in Switzerland compared to Norway? I have known of the Broncos for a long time. American football on this side of the pond is not the grandest of communities yet. And Calanda has definitely made their mark on the European map. I didn’t know the national league too well, but I have tracked their success through Europe. I think the level of play in the national league will find quite a few things in common with Norway. There is a bunch of people working hard to make this great sport elite, but you also have those that only plays for fun. I believe that Calanda has been able to sell their program as an elite program to the absolute majority of their players. There are different rules for Imports, and Broncos have done great working signing some absolute top-quality players, that will up the level of play for sure. The Calanda Broncos will be taking part in the Central European Football League (CEFL) This Spring. Can you explain what it means to you to be able to coach a team in one of the highest levels of European football? It means a lot for sure. Ever since I was a kid watching OV going into Europe, playing some very good teams, it has set the standard. In this game, I think you always want to be at the highest level possible, and play the best opponent possible. If you are not after that, I don’t think this sport is your best fit. I have started to look at our own program, and those we are to face in Europe. And it is quality programs across the board. I am very exited to tackle that challenge. 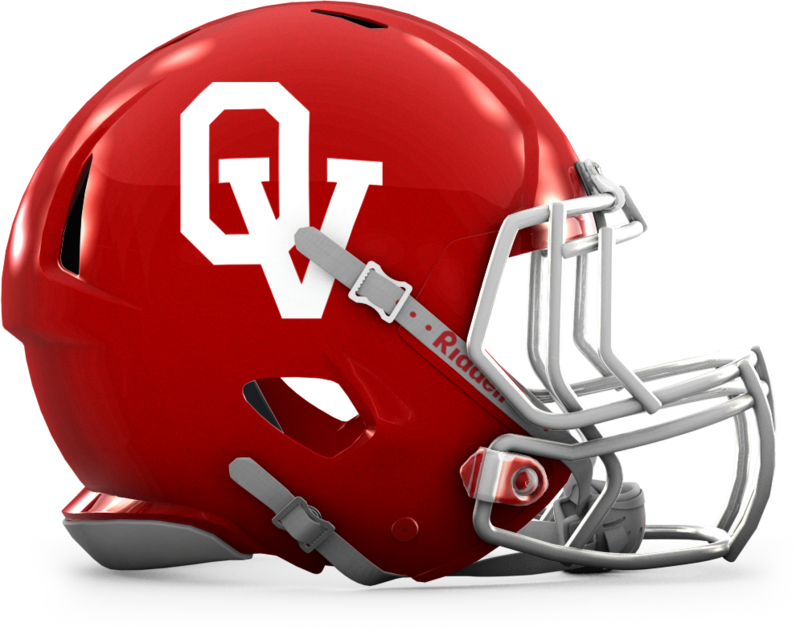 Fun note, Coach Val Gunn, former HC for OV during some great years, will take his polish team and face us in the CEFL, which sets the stage for a very meaningful battle for me! What are you goals both on the football field as a coach and off the field as a person? First off, I am very exited and grateful for the opportunity. I want to learn as much as I can, grow as a human being as well as a football coach. I think working with Geoff and the Broncos sets a great stage for that. But I am absolutely here to deliver my very best product as well. It is a rare thing to be able to get to do this full time professionally, and I have every intension to make the absolute most out of it. I think we have a great chance to reach as far as you can go in Europe, and I will to what I can to help this team there. Also, it is a beautiful place so I have some off-field goals on embracing the nature, the culture and the people there. I might even try to take some non-football photos while I am there. Oslo Vikings coaching staff pre game 2016 National Championship. 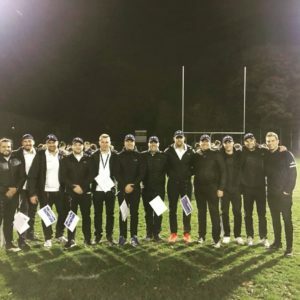 How did being a member of the Oslo Vikings organization prepare you for this great opportunity? Oh, it’s meant a lot. I have been raised as much by the “elders” or the “originals” if you will, in this club as anywhere else. Not to say I didn’t have great parents doing their job, they absolutely did. And I am forever grateful for it. But I have spent 18 years, and about 30 seasons with this organization. People like “daddy” Homer, Garry, Paulsboe, “uncle” Eddy, Vilhelm Lae, David Rødsand, Henrik Dahl and Finn Jarle Mathisen have had a huge impact on who I am as a person. But they also gave me the love for the sport, and in many ways passed on the torch. Then I have been very fortunate to work with the different staffs that has put this organization where it is today. And I truly believe that a lot of OVs success stems from the consistently great staff they keep/put together. And that has had a huge impact on my growth as a coach. I am forever grateful for what the OV community have meant, and will always mean for me. Team Norway coaching staff in the 2018 Nordic Championship. On behalf of the entire Oslo Vikings organization, we would like to wish Coach Knutsen the best of luck for his 2019 campaign. We will be watching your success from back home in Norway!